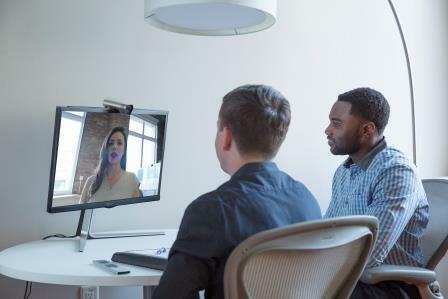 Dedicated to creating superior collaboration experiences in any workspace, Polycom, Inc. (Nasdaq:PLCM) today announced two new Polycom(R) RealPresence(R) Group Series video collaboration solutions that transform small workspaces into high-powered collaboration hubs. The emergence of huddle rooms-which Frost & Sullivan predicts will reach into the tens of millions by 2020 due to greater emphasis on open office spaces-has created demand for high-quality voice, video and content collaboration solutions specifically designed for these kinds of ad hoc meeting environments. Polycom(R) RealPresence(R) Group ConveneTM video collaboration solution is right-sized for any small workspace-from huddle rooms and personal workspaces to open office environments. Designed to work with Polycom’s industry-leading Polycom(R) RealPresence(R) Group Series solutions and Polycom(R) EagleEyeTM Acoustic camera, Polycom RealPresence Group Convene delivers rich 1080p60 video and content collaboration, crisp audio and an easy-to-use interface. It’s sleek and compact design is customizable, with a single or dual screen display and tabletop stand or wall mount, allowing anyone to create a productive work environment tailored to their needs and space. The complete system is easy to set up and also integrates natively with Microsoft Lync 2013. Polycom RealPresence Group Convene works with the Polycom(R) RealPresence(R) Group 500 and the brand new Polycom(R) RealPresence(R) Group 310 video collaboration solutions. The Polycom RealPresence Group 310 solution features simple installation and a compact design that provides a high-quality collaborative experience for small conference and huddle rooms. Building upon the functionality and quality of the Polycom RealPresence Group 300 solution, the Polycom RealPresence Group 310 adds a new level of clarity to business communications. Content can now be sent and received in up to 1080p60 quality and is easily shared through direct HDMI or VGA connections, or by using the Polycom(R) People+ContentTM IP application. These improvements allow participants to share everything from animations and videos, to medical diagrams and CAD drawings, with the same full, rich detail they see on their own computer screens. Polycom(R) SmartPairingTM technology also allows people to share and annotate on documents from their mobile devices or PCs wirelessly. Coupled with Polycom(R) EagleEyeTM IV, a camera with powerful optical zoom and optional wide-angle lens to capture everyone in the room, and Polycom(R) EagleEyeTM Producer technology, which automatically frames participants using the latest in facial recognition, collaboration becomes more intuitive and interactive. RealPresence Group 310 video collaboration solution also inherits Polycom-only audio benefits, including conversational stereo and Polycom(R) NoiseBlockTM technology, providing an exceptional user experience. The Polycom RealPresence Group Convene and Polycom RealPresence Group 310 video collaboration solutions are now available. (c) 2015 Polycom, Inc. All rights reserved. POLYCOM(R), the Polycom logo, and the names and marks associated with Polycom’s products are trademarks and/or service marks of Polycom, Inc. and are registered and/or common law marks in the United States and various other countries. All other trademarks are property of their respective owners.